This partially-vacant strip mall, formerly home of Sports Authority, is a convenient parking spot for the northern part of the trail. Grants Trail crosses Watson immediately east of the strip mall, and curves directly behind the mall. The Applebee's restaurant is a great place to grab a meal after your ride. 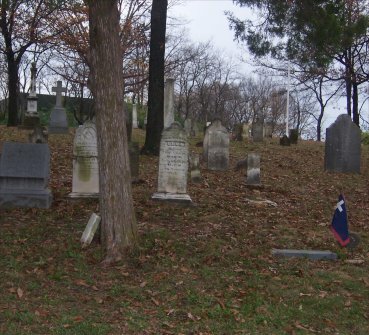 Side trip: Historic Sappington Cemetery, established in 1811, is located on Watson road 2/10 of a mile west (toward Crestwood Plaza) from where the trail crosses Watson. If you're interested in old cemeteries, you'll also find Father Dickson Cemetery along the trail. Parking: There is a large lot with plenty of space. However, this is not an "official" trail parking lot, so, please be courteous of the businesses and park toward the far end of the lot. If you really want to show your appreciation for the parking lot, drop in for a meal at Applebee's. Trail Access: The trail crosses Watson directly east of this strip mall. The parking lot is at the northwest corner where the trail crosses Watson Road. Take I-44 to the Elm Ave exit (exit 280). Go south on Elm to Watson Road. Go right (east) on Watson. At the second traffic light, the Applebee's strip mall will be on the right. The trail is just east of the stoplight. From 270, take the 44 East/Watson exit, and stay right to go onto Watson. Head east on Watson for about 2.25 miles. Look for the strip mall on the left, at the bottom of the hill after passing Westfield Crestwood Mall. The trail is just east of the stoplight.